MMR-D pancreatic cancer have been reported to respond to checkpoint inhibitor therapy. Here, we report the first case of acquired resistance to immunotherapy in MMR-D pancreatic cancer. A 45-year-old woman with unresectable MMR-D pancreatic cancer was initially treated with FOLFIRINOX, FOLFIRI, and stereotactic body radiation with stable disease burden. After 3 months, imaging showed progression of disease with an increase in CA19-9. She was subsequently enrolled in a clinical trial of an anti-PD-L1 antibody in combination with an IDO1 inhibitor. She demonstrated a partial response to therapy by RECIST 1.1 criteria with declining tumor markers. Twenty-two months after beginning immunotherapy, imaging revealed an increasing left ovarian cystic mass. There were no other sites of progressive disease. The patient underwent a total hysterectomy and bilateral salpingo-oophorectomy, appendectomy, omentectomy and pelvic lymphadenopathy. Pathology was consistent with a metastasis from the pancreas involving the endometrium and left ovary. Thereafter, the patient continued with PD-1 blockade therapy off protocol with no further progressive disease. Immune profiling showed high levels of CD8+ T cells and PD-1 positive immune cells infiltrating the tumor, with a moderate level of PD-L1 expression in both the immune cells and the tumor cells. Next generation sequencing found only the KRAS G12D and RNF43 G659Vfs*41 mutations were retained from the pre-treatment tumor in the treatment-resistant tumor. This is the first report describing acquired resistance to immunotherapy in MMR-D pancreatic cancer with accompanying genomic and immune profiling. This case of oligoprogression in the setting of immunotherapy demonstrates the feasibility of localized treatment followed by continuation of immunotherapy to sustain ongoing response. As checkpoint inhibitors have now entered broad use for the treatment of solid tumors, an increasing number of patients who initially respond to immunotherapy have been identified to develop acquired resistance. Such reports have been described in individuals with melanoma, non-small cell lung cancer (NSCLC), uterine leiomyosarcoma, and mismatch repair deficient (MMR-D) colorectal cancer (CRC) patients [1–7]. Pancreatic ductal adenocarcinoma (PDAC) has been largely refractory to single and combination checkpoint inhibitor therapy [8–10]. The tumor microenvironment of PDAC have been described to be largely immunosuppressive, with involvement of regulatory T cells, tumor-associated macrophages (TAMs), and myeloid-derived suppressive cells (MDSCs) [11–13]. Another contributing factor to PDAC’s immunotherapy resistance may be PDAC’s relatively low tumor mutation burden (TMB) and poor antigenicity, leading to impaired endogenous T cell response to the tumor . TMB, in general, has been reported to have a significant correlation with objective response rate to PD-1 inhibition . However, a rare subset of PDAC patients with MMR-D has been reported to have partial and complete responses to immunotherapy [1, 14]. MMR-D occurs at a frequency of < 1% of all PDAC patients and is typically associated with germline mutations in MMR genes, IHC loss of MMR expression, an elevated MSIsensor score, significantly prolonged survival times, and high TMB. Here, we describe a patient with locally advanced MMR-D PDAC who had a partial response to checkpoint inhibitor therapy, but subsequently acquired resistance to therapy and developed a metastasis to the ovary. We evaluated tumor cell-intrinsic and extrinsic causes of acquired resistance in the metastatic tumor. We determined the tumor mutational profile before and after acquired resistance using next generation sequencing (NGS) and assessed PD-1, PD-L1, and CD8+ T cell levels in the immunotherapy-resistant tumor specimen. An otherwise healthy 45-year-old woman with known Lynch syndrome (germline mutation in MLH1) presented in 2014 with abdominal bloating. Computed tomography (CT) showed a 4 cm pancreatic body mass encasing the portal vein, splenomesenteric confluence, and common hepatic artery with enlarged periportal lymph nodes present. Biopsy revealed pancreatic adenocarcinoma. The patient was deemed to have unresectable disease and treated with FOLFIRINOX (5-fluorouracil, folinic acid, irinotecan, oxaliplatin) and FOLFIRI with stable disease burden and declining tumor markers (Fig. 1). She also received stereotactic body radiation therapy (SBRT) 3300 cGy in five fractions. In 2015, CT scan revealed progression of disease, along with a rise in CA19-9 and clinical symptoms. The patient was enrolled in a clinical trial (NCT 02471846) of an anti-PD-L1 antibody in combination with an IDO1 inhibitor (navoximod). She demonstrated a partial response as defined by RECIST 1.1 criteria with declining tumor markers and prompt resolution of symptoms. In 2017, 22 months after beginning therapy, CT scan revealed an increasing left ovarian cystic mass. There were no other sites of progressive disease. The patient underwent a total hysterectomy and bilateral salpingo-oophorectomy, appendectomy, omentectomy and pelvic lymphadenopathy. Pathology was consistent with a metastasis from the pancreas involving the endometrium and left ovary. Thereafter, the patient continued with PD-1 blockade therapy off protocol with no further progressive disease. Tumor mutation profile and burden were determined through MSK-IMPACT, a next generation sequencing assay of somatic mutations in key cancer genes . TMB was 50.2 mutations per megabase (mt/Mb) in the pretreatment sample and 21.1 mt/Mb in the acquired resistance sample (Table 1); both tumors were computationally consistent with microsatellite-instability high. Only the KRAS G12D and RNF43 G659Vfs*41 mutations were retained from the pre-treatment tumor in the treatment-resistant tumor. No copy number alterations were detected in either the pre-treatment or the acquired resistance tumor sample. There was no loss-of-function mutations or loss of heterozygosity (LOH) in the HLA genes, B2M, PTEN, JAK1, JAK2, or TAP1. Immunohistochemistry (IHC) of the metastatic sample confirmed that the tumor was MMR-D, with loss of MLH1 and PMS2 expression (Fig. 2a-e). 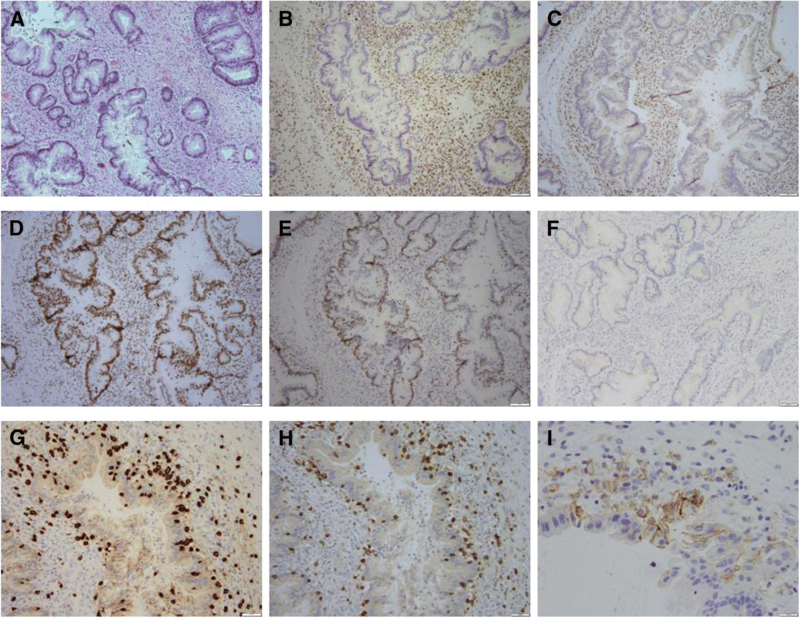 Histologically and immunophenotypically, the tumor exhibited features consistent with a metastasis of pancreatic origin including negative IHC staining for PAX8 (Fig. 2f), a marker typically associated with a Mullerian primary. We were unable to assess immune cell infiltration with IHC in the pre-treatment tumor due to insufficient tissue. However, for the resected treatment-resistant metastasis, we found high levels of CD8+ T cells and PD-1 positive immune cells, with a moderate level of PD-L1 expression in both the immune cells and the tumor cells (Fig. 2g-i). Patients treated with immunotherapy may respond durably, fail to respond, or initially respond but subsequently develop acquired resistance. Acquired resistance to immunotherapy is a consequence of a number of tumor-extrinsic and tumor cell-intrinsic factors . Tumor-extrinsic acquired resistance can be due to insufficient CD8+ T cell infiltration at the tumor microenvironment (TME) and immunosuppression in the TME by regulatory T cells, MDSCs, and TAMs . Mechanisms of tumor-intrinsic acquired resistance include decreases in and loss of neoantigens [2, 4, 19], disruption of neoantigen presentation [3, 5, 20, 21], and resistance to interferon gamma . The ovaries have been previously reported as a potential sanctuary site for malignant gastrointestinal metastases given their resistance to chemotherapy . In this case, however, we did not see a deficit in immune cell infiltration at the ovarian site. Given the abundant CD8+ T cell infiltration, PD-1, and PD-L1 expression in the ovarian site, we speculate that the resistance mechanism is driven less by tumor-extrinsic factors and more by tumor-intrinsic factors. In this case of acquired resistance to PDAC, the decrease in tumor mutation burden after treatment is likely reflective of immunoediting [23–25]. However, the robust T cell infiltration within the resistant tumor microenvironment suggests a potential alternate mechanism restraining productive anti-tumor immunity. Through genomic profiling, we found no changes in loss of function or loss of heterozygosity in previously reported mechanisms of intrinsic resistance, including the HLA genes, B2M, PTEN, JAK1, JAK2, or TAP1. Similar cases in which the driver of resistance is unknown have been reported, and highlight the complexity of resistance in the context of immunotherapy and the need for larger, cooperative efforts to integrate analyses of these uncommon cases in order to reveal mechanistic insight . In this PDAC patient, disease progression only occurred in the ovary, an uncommon site of metastases in PDAC . The phenomenon and management of oligoprogression in the setting of acquired resistance to targeted therapy have been previously described in NSCLC . But oligoprogression in the setting of acquired resistance to immunotherapy is less well described. A case series of acquired resistance to PD-1 axis inhibitors in 26 NSCLC patients found that a majority (89%) of these patients had recurrence limited to one or two sites of disease . Isolated progression was also reported in the majority (78%) of 36 melanoma patients with acquired resistance to PD-1 blockade . MMR-D patients under PD-1 blockade have been reported to develop acquired resistance, with tumors developing from occult sites such as the brain and the bone . The present report has notable limitations. No clear mechanism of resistance was determined, although we speculate that immunoediting is a primary driving mechanism. Immunoediting is a dynamic dialogue between the immune system and the invading system that consists of elimination, equilibrium, and escape phases . In the elimination phase, tumor cells are identified and eliminated by the immune system. In the equilibrium phase, the immune system is unable to eliminate all cancer cells but is able to contain further growth. In the escape phase, tumor cells variants are selected to proliferate in an immunologically intact environment. Genetic and epigenetic changes within these tumor cells grant additional resistance to immune elimination, allowing the tumor cells to grow. Further in vitro studies are needed to determine the specific acquired changes within the tumor and the selection pressure exerted by PD-L1 therapy. We also had insufficient pre-treatment tissue for immunopathologic testing to directly compare the phenotypic changes. 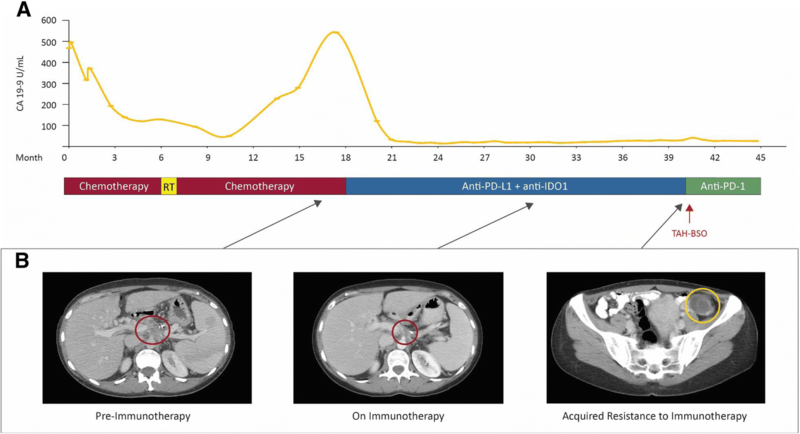 This is the first reported case, to our knowledge, of acquired immunotherapy resistance in PDAC with accompanying genomic and immune profiling of the metastasis. This case of oligoprogression in the setting of immunotherapy also highlights the feasibility of localized treatment followed by continuation of immunotherapy to sustain ongoing response elsewhere. A number of factors, including tumor heterogeneity, the specific resistance mechanism, and tissue-specific immunoregulation, likely influence the sites, extent, and rate of disease progression in acquired resistance to immunotherapy, and remain to be fully characterized . The authors wish to gratefully acknowledge the patient and her family for allowing us to publish her case report. This work was supported in part by the National Cancer Institute Cancer Center Core Grant No. P30-17 CA008748. All authors were involved in the generation of figures and writing of the manuscript. All authors read and approved the final manuscript. The patient described in this case signed a case report informed consent form which is available for review. The patient consented to publication of the case report. Informed written consent was obtained from patient for publication of this case. Consent is available upon request. Eileen M. O'Reilly (EOR): Research Funding Celgene, Sanofi, ActaBiologica, AstraZenica, Silenseed, Genentech-Roche. Consulting: Targovax, Celgene, Bayer. Matthew D. Hellman (MDH) receives research funding from Bristol-Myers Squibb; is paid consultant to Merck, Bristol-Myers Squibb, AztraZeneca, Genentech/Roche, Janssen, Nektar, Syndax, Mirati, and Shattuck Labs; receives travel support/honoraria from AztraZeneca and BMS; and a patent has been filed by MSK related to the use of tumor mutation burden to predict response to immunotherapy (PCT/US2015/062208), which has received licensing fees from PGDx.Luis A. Diaz (LAD) is a member of the board of directors of Personal Genome Diagnostics (PGDx) and Jounce Therapeutics. LAD holds equity in PapGene, Personal Genome Diagnostics (PGDx) and Phoremost. He is a paid consultant for Merck, PGDx and Phoremost. LAD is an inventor of licensed intellectual property related to technology for circulating tumor DNA analyses and mismatch repair deficiency for diagnosis and therapy (WO2016077553A1) from Johns Hopkins University. These licenses and relationships are associated with equity or royalty payments to LAD. The terms of all these arrangements are being managed by Johns Hopkins and Memorial Sloan Kettering in accordance with their conflict of interest policies. In addition, in the past 5 years, LAD has participated as a paid consultant for one-time engagements with Caris, Lyndra, Genocea Biosciences, Illumina and Cell Design Labs. Jedd Wochok (JD) Consultant for: Adaptive Biotech; Advaxis; Amgen; Apricity; Array BioPharma; Ascentage Pharma;Astellas; Beigene; Bristol Myers Squibb; Celgene; Chugai; Elucida; Eli Lilly; F Star; Genentech; Imvaq; Kleo Pharma; MedImmune; Merck; Neon Therapuetics; Ono; Polaris Pharma; Polynoma; Psioxus; Puretech; Recepta; Trieza; Sellas Life Sciences; Serametrix; Surface Oncology; Syndax. Research support: Bristol Myers Squibb; Medimmune; Merck Pharmaceuticals; Genentech. Equity in: Potenza Therapeutics; Tizona Pharmaceuticals; Adaptive Biotechnologies; Elucida; Imvaq; Beigene; Trieza.Zsofia Stadler (ZK): Immediate Family Member, Ophthalmology Consulting/Advisory Role: Allergan, Adverum Biotechnologies, Alimera Sciences, Biomarin, Fortress Biotech, Genentech, Novartis, Optos, Regeneron, Regenxbio, Spark Therapeutics. The other authors (ZIH, MV, JS) declare that they have no competing interests.